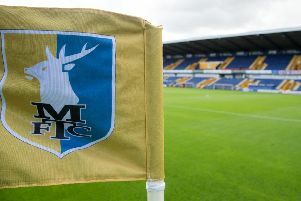 Saturday’s performance and the result was a return of the Mansfield Town we all know and love. The Stags got back to winning ways at Exeter City with an emphatic performance, scoring four goals, which saw CJ Hamilton and Tyler Walker net two apiece. Let’s just hope we can be consistent from now to the end of the season. Big credit to the manager for not only picking the right team, but for identifying certain players who are playing as an individuals rather than a team. It seemed a coincidence that when Jorge Grant and Nicky Ajose weren’t in the side, we went on to dominate and win the match. It begs the question are they the problem in the dressing room? For me, Grant is as his attitude and work rate are poor as he doesn’t get involved enough. Ajose works hard, but hasn’t delivered on his chances. If these lads have got anything about them they would step up or go back to their parent clubs if they aren’t up for the fight. We want players who are going to play for the shirt and town. Every single one of the lads who played against Exeter, showed that they did on that performance. Before the game I wasn’t optimistic with how the past few weeks have been, but credit to the players and credit to the manager for picking a team that ran for each other, but importantly the town. It makes last week’s result so frustrating as, when we perform like we did against Exeter, you can’t figure out why it didn’t work against Crewe. But I guess that’s just football for you - a strange game. In my opinion I thought all of the lads played well, so it makes it difficult to single out players as they were all a credit to themselves. All afternoon Exeter couldn’t handle the long balls and pace from CJ and Walker, who both punished them. It really surprised me how poor Exeter were as they hardly threatened and were miles off the pace. Usually they are a good footballing side, but it just shows how dominant we were by restricting them from testing Conrad Logan and bombarding their defence with the pace within our side. Prior to the game they had won their last two games, showing that they are a decent outfit in this league. They only scored the one goal, due to some poor defending from our point of view. Without getting too carried away, this result shows we are still in with a shout for an automatic promotion spot. Hopefully, the result will give the players a real confidence boost and the team can go on a winning run. As long as we can just keep on focusing on ourselves and taking care of our business, then we should be on course for promotion. All of the goals were well taken by both Walker and Hamilton. CJ showed some individual brilliance in both of his goals by causing panic in Exeter’s defence. His persistence also led to Walker being brought down in the box, resulting in a penalty kick to the Stags. As he ran towards goal he played a neat pass to Walker, who got brought down from behind as he was about to set himself for a shot at goal. Tyler’s first goal was a thing of beauty, as he curled the ball from 20 yards from the left hand side and his second was the penalty kick, which he blasted home to seal us the three points. At 4-1 up it would have made sense to see Jimmy Knowles be introduced, even if it was for 10 minutes, as it would have given the lads loads of confidence. But it was great seeing Zayn Hakeem for the last few minutes of the match, as he is another promising youngster. It was also great to see Danny Rose on the bench, as he looks to be recovering ahead of schedule. As always credit to Stags fans, for making the longest journey of the season down to Exeter, playing a huge part in getting behind the lads, as we have done all season. Onwards and upwards.